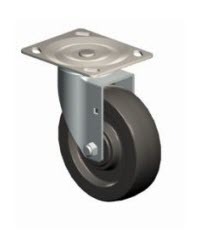 Our medium duty swivel casters are designed for shock absorption to cushion the load and produce a reliable, consistent roll. Pressed steel double ball bearings ensure long service life. The medium duty swivel caster is designed to withstand continuous service and is ideal for restaurant, school, or hospital carts. Click here if you require a medium duty caster. We offer a large selection of medium duty casters engineered for loads up to 1200 lbs. 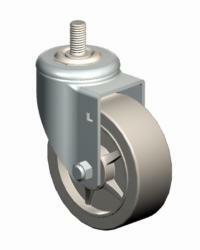 for each caster in different mounting options, wheel sizes, wheel materials, brake options, and bearing types. If you are looking for heavy duty casters (3500 pounds), please click here heavy duty industrial steel casters. If you are looking for light duty casters (450 pounds), please click here light duty industrial steel casters. These medium duty casters are strong, durable, and economical and can be used in a wide variety of industries and applications where swivel and medium duty top plate rigid casters work together. They are recommended for medium duty stock trucks, warehouse trucks, carts, and dollies that use stem threaded medium duty swivel casters. Many of our medium duty casters have 3D Models available for download in most formats, including IGES, STEP, PRO/E, and SolidWorks. California Caster offers medium duty casters for utility platform and furniture trucks, also known as carts. Medium duty casters are used in industrial manufacturing, warehouses, and distribution centers. Medium duty casters are ideal for sheet, bar, bulk, semi-live skid, and nursery carts. They can also be used on modular, work height, U-boat, wagon, extending platform carts, and carts with shelves. Medium duty locking casters provide additional safety. 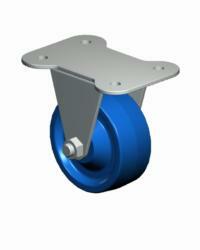 Low profile casters can also work well for industrial platform carts.